I’ve written a handful of posts (here and here and here) about how lions are big and mean and nasty…and about how even though they are nasty enough to keep wild dog populations in check, they don’t seem to be suppressing cheetah numbers. Well, now that research is officially out! It’s just been accepted by the Journal of Animal Ecology and is available here. Virginia Morrell over at ScienceNews did a nice summary of the story and it’s conservation implications here. One dissertation chapter down, just two more to go! Here’s a great post by the BBC about some genetic work that has just been done to shed light on the evolutionary history of lions. Apparently, it’s a bit tricky reconstructing lion history due to the fact that they don’t fossilize particularly well (generally not conducive conditions in lion habitat) and that humans create giant holes in the record by wiping out entire sub-population. However, from genetic analyses of living lions and museum specimens, these authors have determined that there are two evolutionary groups of lions – those in India and Central/West Africa and those in Eastern/Southern Africa. This happens to have some interesting implications for lion conservation and reintroduction — check out the article! To bring myself up to speed with the fundamentals of lion research in the Serengeti, I have spent the last week or so reading through the classic work The Serengeti Lion: A Study of Predator-Prey Relations, by the reputable George B. Schaller. For a collection of field notes, the book it quite a page-turner. 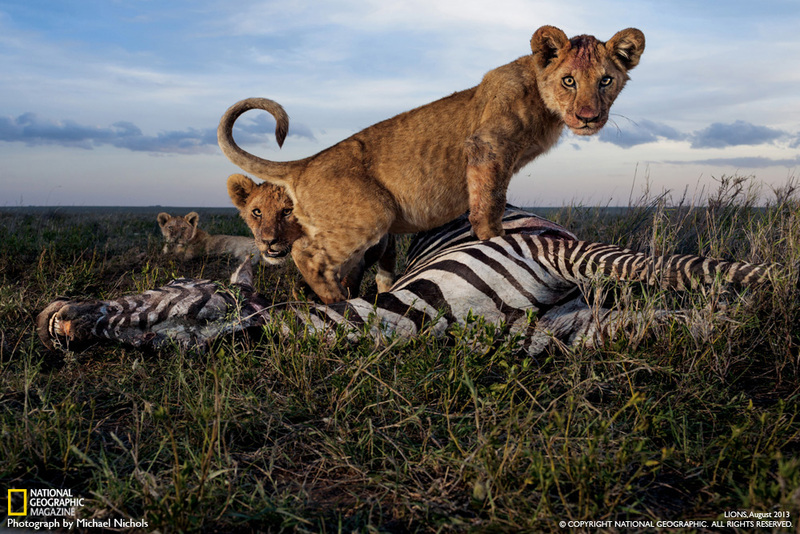 The work covers everything remotely relating to lion biology, from social systems to predation patterns, and manages to capture both the drama of the dynamic Serengeti system and the dusty, hot, sweaty reality of watching big cats sleep for 18 hours a day. 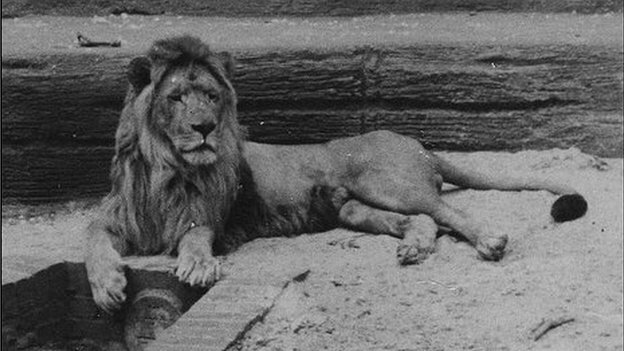 Although the focus of the book is the life of lions, the life of George B. Schaller himself turns out to be just as intriguing. Digging a little into his background, I discovered that Schaller, dubbed the “Megafauna Man” by National Geographic, has undertaken a 50-year career in field biology studying some of the most iconic systems in the world. Schaller had moved to the Serengeti with his wife and two sons for two years in 1966 to uncover the intricacies of the lives of big cats and their prey. This, however, was not the start of his field career. Back in 1959, when he was a mere 26 years old, Schaller packed up and headed off to Central Africa to study the mountain gorilla. For two years, amidst dodging poachers and eluding Watusi invaders, he uncovered facts about these great apes which helped to dispel common notions about their brutishness and revealed them to be gentle and intelligent animals. His work paved the way for other naturalists, including the well-known Dian Fossey, and led to the creation of Virunga National Park. In the ‘70s, Schaller worked in both South Asia and South America, studying large mammals including the blue sheep and snow leopards of Nepal and the jaguars, capybaras, and caimans of Brazil. The American novelist and naturalist Peter Matthiessen accompanied Schaller to Nepal and wrote a travelogue on their exploits (The Snow Leopard) that went on to win the 1979 National Book Award. Matthiessen describes Schaller as “one of the finest field biologists of our time. He pioneered the practice of turning regions of field research into wildlife parks and preserves,” a epithet that held true yet again when five years later, the Nepalese government used Schaller’s research to form Shey-Phoksundo National Park. Following these adventures, Schaller and his wife were given the distinction of being the first westerners invited by China to enter the remote southwest Asian wilderness and research the Giant Panda in its native habitat. As part of this work, Schaller focused on understanding threats to the diminishing panda population and discovered that the primary culprits in their demise were poaching and logging. In his book, The Last Panda, Schaller writes “The panda has no history, only a past. It has come to us in a fragile moment from another time, its obscure life illuminated through the years we tracked it in the forests.” Despite this foreboding prophesy, since Schaller’s work on panda biology, the number of panda in the wild has increased by 45%. In the 1990s, Schaller worked in Laos, Vietnam, and Tibet studying antelope and in the process discovering and rediscovering several species of mammals including a bovine, a pig, and a type of deer. More recently, he has been collaborating with agencies in Pakistan, Afghanistan, Tajikistan, and China to develop a 20,000-square mile “Peace Park” for the protection of the world’s largest wild sheep species, the Marco Polo sheep. Over the span of his career, Schaller has made profound contributions to our knowledge about large mammals, both their biology and ecology, and has greatly furthered species conservation in the creation of over 20 parks and preserves throughout the globe. I can highly recommend his writings on the Serengeti Lion, and if you want to delve further into his life and career, his other authored books (there are over 30) include The Year of the Gorilla, The Last Panda, Tibet Wild, and A Naturalist and Other Beasts. This series of photos was taken at site H11 along the Loyangalani river and remains, to me, one of the most amazing accomplishments of our camera trap survey to date. First, seeing a kill is rare. In the 47 years that the Lion Project has been watching Serengeti’s lions, we’ve only seen lions with about 4,000 carcasses; of those, we’ve only actually seen them in the act of killing 1,100 animals. That might sound like a lot, but with one or two people on the ground, almost every day of the year, racking up nearly 50,000 sightings, that’s not that often. 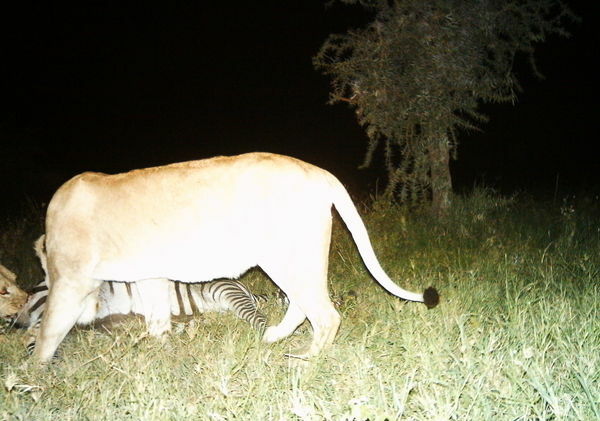 I don’t love this series simply because this random, stationary, complacently-stuck-to-a-tree camera trap caught this rather rare event – but because it goes on to document the story that follows: A single lioness takes down a zebra much bigger than herself. Within minutes, her sister joins her (free meal!). Note how big their bellies already are though, when they begin to eat. These aren’t particularly hungry lions to begin with. 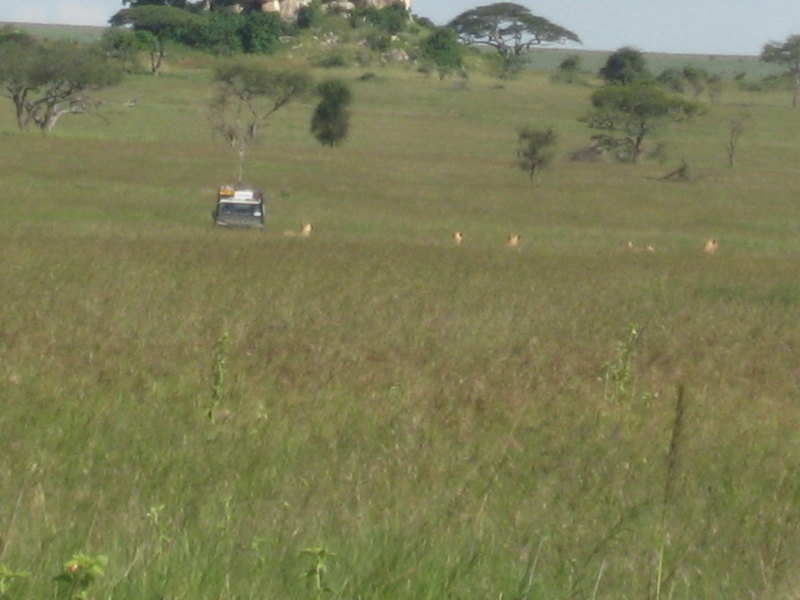 About 45 minutes later, they are staring out of view of the camera, and then comes a group of hyenas. 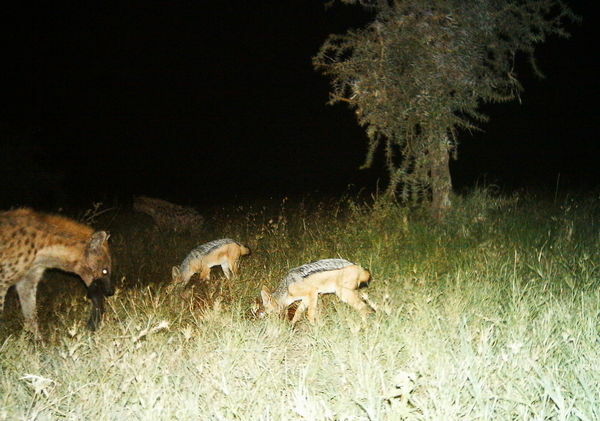 The carcass goes back and forth between them throughout the night, with a jackal darting in to sneak a nibble. 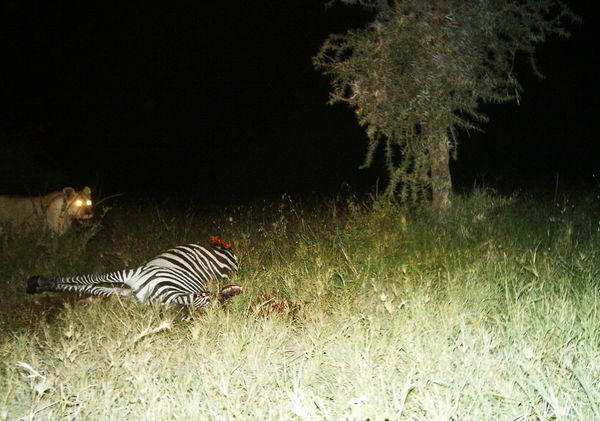 Food stealing, or kleptoparasitism, is a major part of life for Serengeti carnivores. Contrary to long-standing popular belief (reinforced by the Lion King), hyenas are not skulking scavengers living only off others’ leftovers. Hyenas are quite adept predators and scavenge only about 40% of their diet; lions scavenge at least 30% of theirs. And, in fact, lions steal a lot more food from hyenas than is apparent at first glance. 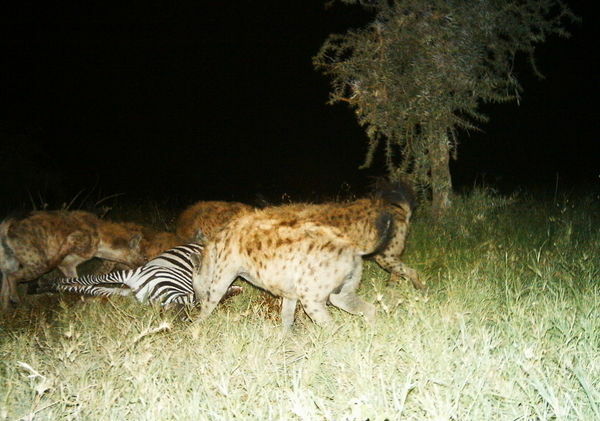 More often than not, when we see hyenas lurking anxiously around a pride of lions demolishing a carcass, it’s because hyenas made the kill, and lions stole it away. Research from Kenya suggests lions might actually suppress hyena populations simply by stealing their food. On the flip side, work from Botswana suggests that hyenas are able to steal food from lions if and only if hyenas outnumber lions by at least 4 to one, and there are no adult male lions present. (Remember, males are half again as big as females: hyenas don’t stand a chance.) 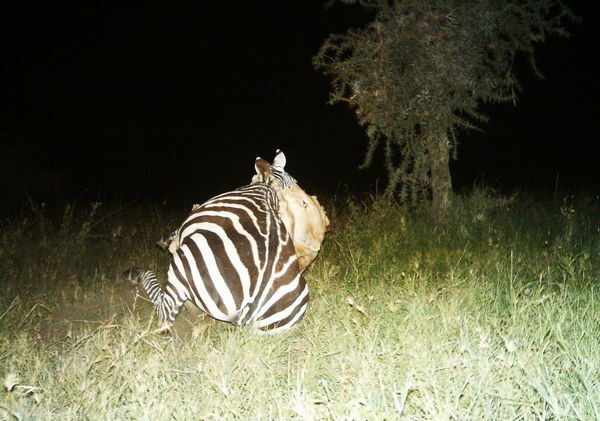 But observations that Craig and a former graduate student made from the Ngorongoro Crater further revealed that even when lions do give up a kill, they are so full they can barely move – it’s simply not worth the effort to fend off hyenas any more. So, kleptoparasitism is a part of life if you are a Serengeti carnivore, but it’s not always as simple as the movies make it out to be. It’s a pretty cool mechanism that might be driving predator dynamics though – I just wish it weren’t so hard to test!! In 1994, a terrible disease ripped through the Serengeti, killing lion after lion. By the end of the year, a third of the lions in the Serengeti were dead. The culprit was a virus known as canine distemper, and lions that died of the disease did not die quietly. The symptoms were clear to any observer: facial twitching, disorientation, and eventually convulsive seizures. The lions in Craig’s study area were not spared, but the data he had been collecting over the previous decades proved invaluable in understanding what happened in 1994. Using archived blood samples that had originally been taken for genetic analysis, Craig and his colleagues were able to go back and test for a number of viruses. The earliest year blood had been sampled was 1984, but because some of the lions sampled had been ten years old or older, he was able to infer information about when lions had been exposed to viruses as early as 1970. 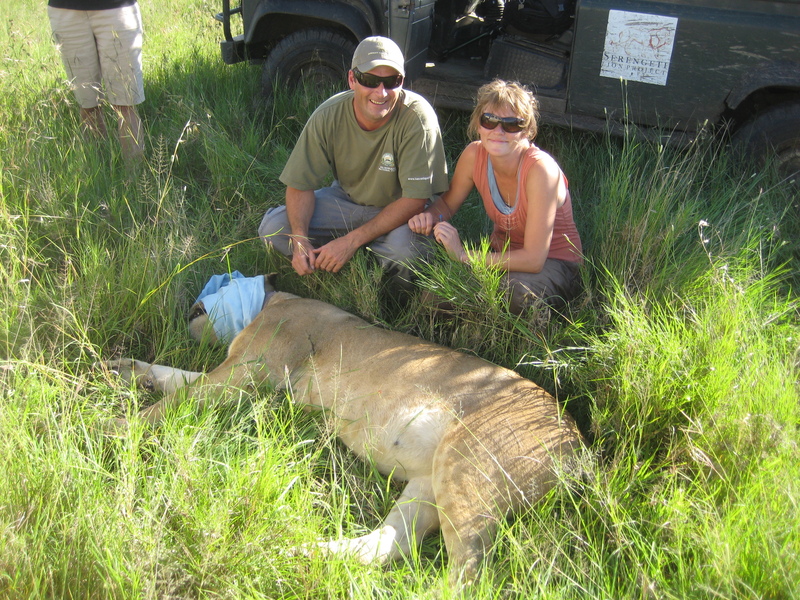 They found that there had been previous outbreaks of canine distemper in the lions in 1977 and 1981. Because the lions had been studied then, he knew that these outbreaks had not caused large die-offs like the one that occurred in 1994. Instead, he found that by 1994, essentially all lions in Serengeti were free from canine distemper antibodies, meaning that none of the lions had any immunity to the disease. This widespread lack of immunity and a mutation in the virus were thought to have caused so many deaths. 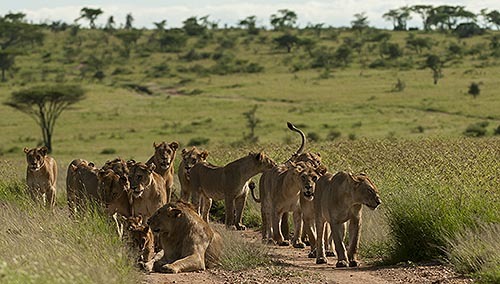 The lion population recovered after the 1994 outbreak. Just years later, though, two “silent” outbreaks hit the population in 1999 and 2006. Unlike the 1994 outbreak, these ones were not noticed at the time because few lions died. They were only detected through blood sample testing. An analysis of the archived blood samples finally revealed the major difference between the canine distemper outbreak that led to massive death and those that did not. High death rates in the 1994 outbreak were due to the simultaneous infection with another disease — a protozoan parasite known as Babesia — that becomes increasingly common during and after major droughts. When Babesia is absent, lions contract canine distemper, but their immune systems fight it and they become immune. When lions are also infected with Babesia, they cannot fight off the canine distemper virus as easily, and more of them get sick and die. 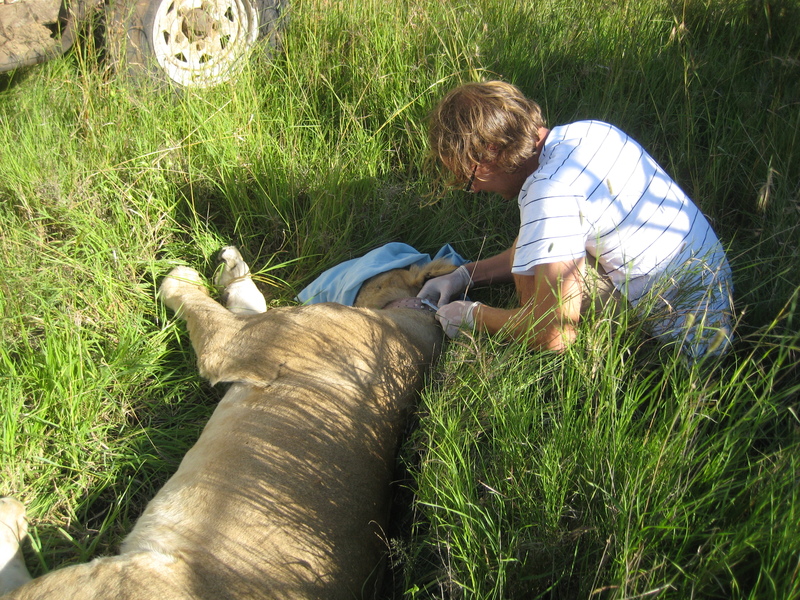 The long-term lion data was also instrumental in understanding the spread of canine distemper in the 1994 outbreak. The disease showed up sporadically in the study area prides, suggesting that lions acquired the disease from an outside source, rather than spreading it from one lion to another. 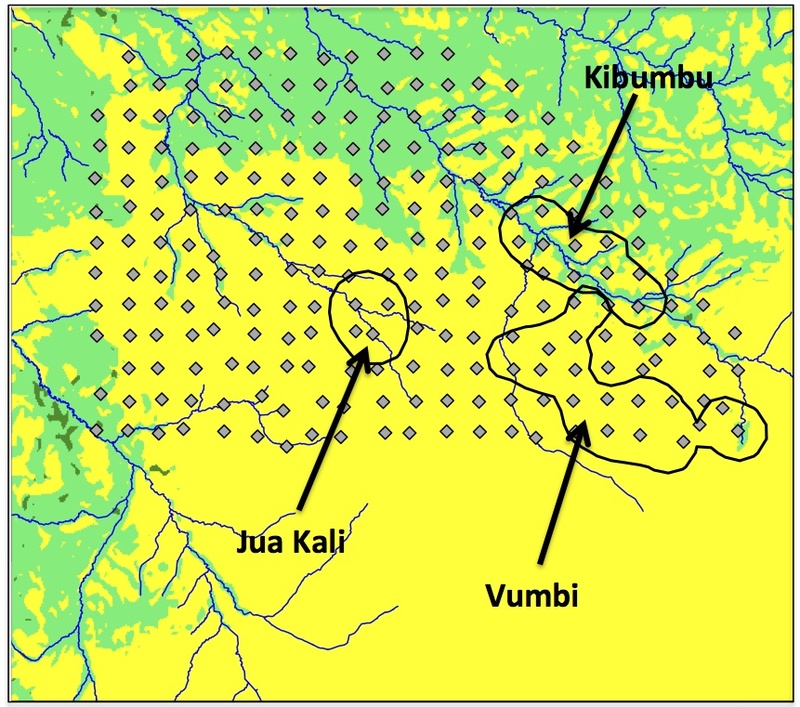 Sophisticated analyses revealed that the origin of the outbreak was likely in domesticated dogs in the human settlements around the Serengeti ecosystem. Further, it is likely that lions acquired the disease repeatedly from hyenas. 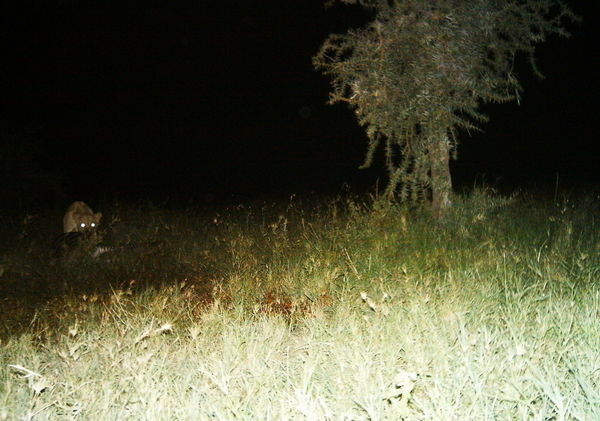 Hyenas move great distances, use human-inhabited areas around the Serengeti more than lions do, and interact with lions at kills. Scientists cannot predict major droughts. Nor can they predict wildlife disease outbreaks. It isn’t possible to recreate major droughts with experiments in vast wilderness areas. Nor is it ethical to introduce novel diseases into natural areas in order to understand more about the disease. 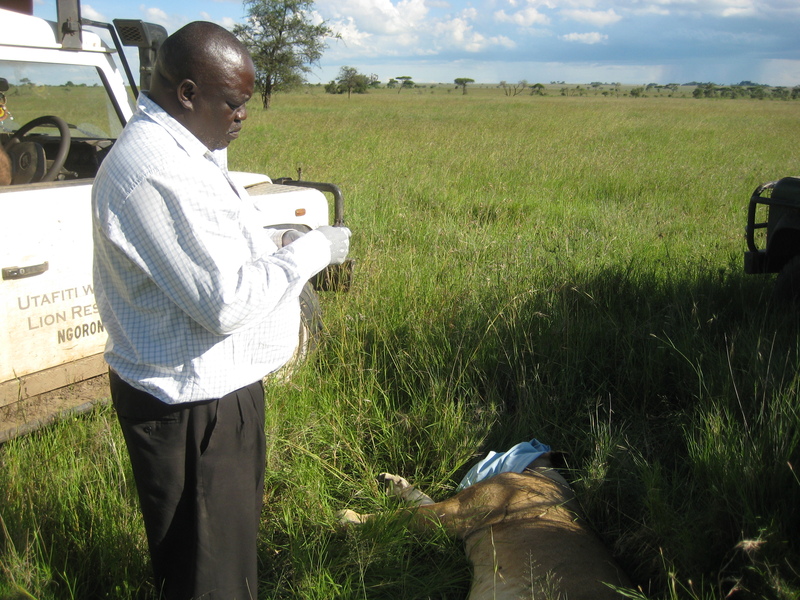 It is ONLY through long-term research projects like the Serengeti Lion Project that we acquire the data necessary to understand what happens in nature during disease outbreaks, droughts, and other rare, but important events. Ideally we would like to run Snapshot Serengeti for at least a decade. We want to be able to capture some drought years in our data set, and some years with unusually wet dry seasons. We want our cameras to be running when the next unexpected disease outbreak occurs — in lions or in other species. To those of you have already contributed to our crowd-funding campaign, a heartfelt thank you. If you haven’t yet, and are able, please consider a donation. Munson, L., K.A. Terio, R. Kock, T. Mlengeya, M.E. Roelke, E. Dubovi, B. Summers, A.R.E. Sinclair & C. Packer. 2008. 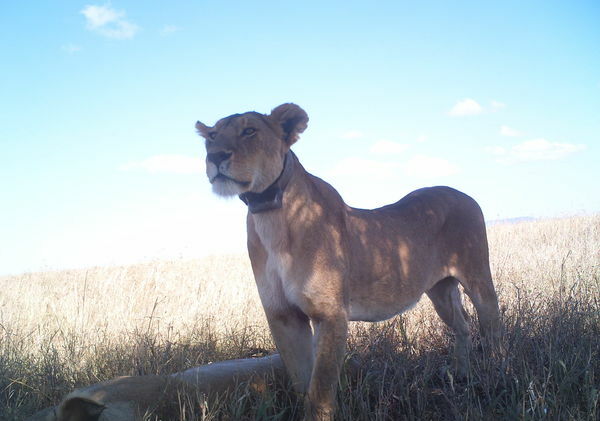 Climate extremes and co-infections determine mortality during epidemics in African lions. PLoS-One 3, e2545.